Peach's Birthday Cake is Princess Peach's board in Mario Party. The players compete on a large two-layered cake. It is made by the princess herself according to Toad as well as the ribbon on the side of the cake. It has 2 Stars of difficulty out of 3, meaning it's not either easy or difficult. At the end of the game the winner's Stars form into a large star causing the cake to light up. The winner as well as the players in second and third stand on the cake. The losing player is seen getting attacked by a Piranha Plant. This board has a lot of Happening Spaces on the exterior floor of the main cake. However, Blue Spaces still appear on that floor and are predominant in other areas. 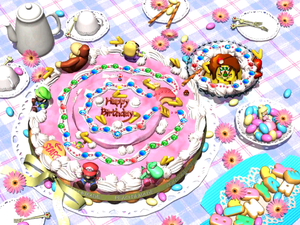 The Star Space is also stationary, atop the cake in the center of the board and the six playable characters are made out of fondant, with five being on top of the cake while one of Peach is in the bowl of colorful sweets. The cake is double layered, with the player going onto the second layer via a "bridge". In addition, aside from the cake itself, there is also a partially bitten hot-fudge whipped sundae nearby that houses Bowser where he provides his Bowser Cake that is inedible. This area can only be accessed if the player "wins" the flower lottery (ie, they get a flower depicting Bowser's face on it). During the game's ending, aside from the cake having candles, the hot fudge whipped sundae is depicted as whole. When the player reaches Goomba, they must pay 10 Coins (or all their Coins if they have 10 or less) to play a game called the Flower Lottery. There are four seeds of different colors (red, blue, yellow and green) and the player must bloom one (after blooming a whole set, another set appears). Three of them have Toad's face imprinted inside them: if the player finds one, they'll "lose" and take the Star's path. However, if the player chooses the seed with Bowser's face, they'll "win" and are forced to proceed to Bowser's cake. If the player lands on a Happening Space, they can bury a Strawberry Seed for 30 Coins, that then grows in a Piranha Plant (similar to a Piranha Pod). If a player lands on this space, the unlucky player will lose a Star that the burier will gain. The plant will then disappear, unless the target has no Star, in which case the plant will do nothing anyway. Technically, they act similar to Boos in other boards. Bowser is on his cake. It can be reached by losing at Goomba's lottery. When the player stops by, they will get a Bowser Cake for 20 Coins. It is completely useless and highly reduces the probability of the player to get a Star when they'll return to the main cake. Screenshot of Peach's Birthday Cake. Peach's Birthday Cake during the ending of the board game. "Princess Toadstool made this cake. What do you think? Isn't it cute?" "It looks like there is going to be some kind of party here. What kind of party? I don't even know that." "I wonder if there are any more party-like decorations around here somewhere?" "That'd be great if it's a fun party. Oh! Now..., I'm getting excited!" "The party will be starting soon. Won't you decorate the cake? It seems like it's missing something..."
"Big, beautiful, shiny decorations..., I think I know what it needs!" This board is the only one not to have a Boo anywhere, though it is possible to get one with an Event Block, and their role is overall used with the Strawberry Seeds. When a player gets a Star, Toad sometimes says, "Princess Toadstool made this cake. What do you think? Isn't it cute?". Not counting Super Mario 64, this makes Mario Party one of the only two games in the Mario series in which the Princess is referred to as both "Toadstool" and "Peach", the other being Mario Party 2. Part of the music for this board is a rendition of part of the Super Mario Bros. theme. This page was last edited on April 6, 2019, at 14:04.